Many couples within the entertainment industry are now eager to make money by appearing on shows together. Companies also tend to favour the idea, since it generates more buzz and higher viewership ratings. 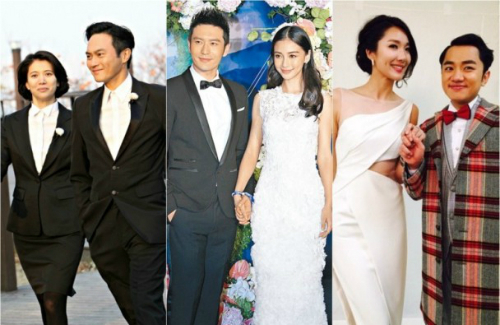 Popular celebrity couples include Chilam Cheung (張智霖) and Anita Yuen (袁詠儀), Huang Xiaoming (黃曉明) and Angelababy (楊穎), Wong Cho Lam (王祖藍) and Leanne Li (李亞男), as well as Tian Liang (田亮) and Ye Yiqian (葉一茜). From dating to getting married, Chilam and Anita have filmed with each other and also appeared on variety shows. Last year, Mainland Chinese station, Zhejiang Television, offered 36 million HKD to invite the couple to star in the reality show, There’s You On This Road <一路上有你>. The show involves having different couples overcome various challenges while travelling in South Korea. Tian Liang and Ye Yiqian were also invited to appear on There’s You On This Road with 29 million HKD. Tian Liang’s popularity skyrocketed after participating in the first season of Where Are We Going, Dad? <爸爸去哪兒> with his daughter. Since then, he has attended many events with his wife. Angelababy’s popularity also soared in Mainland China due to her appearance in the reality television show, Hurry Up, Brother <奔跑吧兄弟>. Her husband, Huang Xiaoming, is also a renowned artiste, and the couple’s high-profile relationship has always been in the media’s spotlight. According to sources, they are being paid as much as 24 million HKD to appear on shows together. Wong Cho Lam and Leanne appeared onscreen together several times as a couple prior to their marriage and reportedly pocketed up to 2 million HKD. After marriage, the two were invited to attend an onstage performance in Malaysia back in July. Sources claim they earned 3 million HKD for their appearance. The only celebrity in the Wong Cho Lam (王祖藍) and Leanne Li (李亞男) pair is Wong Cho Lam. He was able to ride Eric Tsang’s stardom to build a path to his own and now he is able to get so much attention on Leanne as well. She would still be a 3rd line tvb nobody if it weren’t for Cho Lam. Gotta hand it to that guy, he did good. You forgot Li Chen and Fan Bing Bing- they have a variety show coming up. Leanne Li and Wong Cho Lam were invited onstage in Malaysia to perform Beauty and the Beast. But the Malaysians must have been very disappointed because in the actual Beauty and the Beast story, the Beast turned (back) into a very handsome prince. But Wong Cho Lam can’t turn into anything but himself, still short and ugly. I agree with you and feel sorry for her too. @anon Why feel sorry for me? You and hetieshou should feel sorry for WCL because he will forever short and ugly and will forever have to shower Leanne with material gifts to keep her. WCL is the pitiful one so give your sympathies to him not me. I can almost feel the increasing pressure on him to earn more money and at same time worrying about his wife running off with a better looking and richer guy than him. It will happen so watch this space. @siro12345 What so pathetic about me? It’s people like you who can’t accept realistic comments but want to live in a make believe world that are pathetic. Get real you people! Everyone feels sorry for you because you are simply delusional. You are forcing your so-called “realistic” comments onto others when its merely your own opinion. You have no facts to back up your statements. Yet you are going on and on in every single article repeating yourself. The only reason you are so persistent in repeating yourself is because you know others aren’t listening to you. You know others don’t agree with you, so you continue to repeat yourself whenever possible. Like I said, go out and experience life, sitting behind the computer complaining like a broken record isn’t good for you. @minyveg i dont mean to be rude but i couldnt stop laughing at the last thing you wrote. People like you like to be magnanimous so as to gain approval of others. People like you dare not say things that are true for fear of causing offence. People like you like to go with the flow so as to be accepted as one of them. People like you must learn to have some guts to say things that don’t go down well with the majority but of which is true. People like you speak against your conscience. People like you ought to be feeling sorry for yourself instead. @freedalas You assume that all majority/popular/widely acfepted opinions and point of views are wrong. You assume that just because one says something against the majority, one is automatically right. Society as a whole condemn killing other people, so if one or a handful stands up and says, no killing is just a way of life. It’s natural to eliminate the weak, take back the Earth and live more comfortably. By your logic, these small group of people are absolutely right. So kill away! A bit extreme analogy but it’s solid and relevant to your claim above. @jjwong Your analogy is not just a bit extreme as you yourself said. It’s totally ridiculous. If you can’t win an argument, don’t resort to something so downright nonsensical to support your case. Stick to the topic at hand which is Leanne Li marrying the short and ugly WCL for his wealth and fame. Put forth your arguments by all means but don’t go out of context with such a totally out of point analogy. @freedalas you seriously crack me up. A pot calling a kettle black. Telling me to keep on topic when you practically name drop WCL in articleS that have nothing to do with him. I used extreme analogy to show how extremely false and incoherent of YOUR so called definition of “truth” and how you can see the truth because your OPINION goes against the tide. Opinions are not facts. @freedalas as i said, it’s extreme but totally relevant and is not out of context. Besides, this article talks about wlc and ll get more $ when they appear as a couple. It has nothing to do with why ll married wcl. YOU instigated that. Then YOU ranted off about going against the flow is speaking against our conscious and accusing people gutless just because they don’t share your view. So who’s out of context? @jjwong I shall stop feeding the troll now. Have a nice life. Since you are clutching at straws, I won’t counter you any longer so as to make you drown even faster. It’s so apparent that you can’t substantiate what you post and in desperation come out with something totally irrelevant. That’s clear for all to see. @freedalas well that’s pretty rude and shallow. why do you hate him so much? I believe their marriage has nothing to do with his look or money but just love. He’s a funny guy and a good guy and they are happy together. Sometimes that’s all a girl need in a guy you know. Who knew what she’d been through before. @kaykay408 no need to get to freedalas, this person is too narrow-minded and assumes that Leanne may think like them. Freedalas may look for looks only and if not, for their riches if they are “rich” and “ugly” but i don’t think that’s the case with Leanne.